2017 is the 100 year anniversary of the 1st recorded jazz records on many labels including Victor, Columbia and Aeolian Vocalion Records. 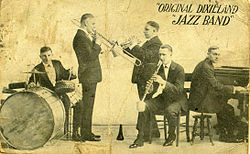 “Dixieland Jass Band One-Step” also known as “Dixie Jass Band One-Step” and “Original Dixieland One-Step” is a 1917 jazz composition by the Original Dixieland Jass Band released as an instrumental as a Victor 78. The song is a jazz milestone as the first commercially released “jass” or jazz song.